The Shenandoah Valley's historic caves helped create modern-day American leisure travel. On Labor Day Sunday, 1924, more than 800 cars streamed up a dusty road near New Market, Va., to a parking lot at the base of Massanutten Shenandoah Valley. All day, people lined up in front of a crude stone cottage built several years earlier. Though humble, the cottage, according to a vintage postcard caption, fairly beckoned visitors “into the realm of underground wonders over which it stands guard.” By 10 p.m., some 3,000 paying customers had ducked through the door, though none exited. Similarly beckoned, I roll up to Endless Caverns on a warm November Sunday 89 years later. The parking lot is empty. The entrance cottage is closed, but a larger limestone building is open for business. Trailed by my 10-year-old daughter, Eliot, and my son Luther, 14, I enter and find a middle-aged man behind a glass counter filled with pyrite, quartz crystals, geodes, and Native American arrowheads. “We’re here for the noon tour,” I say. Turns out we’re the only ones. Ten minutes later, we’re following a young woman with a headlamp draped around her neck into the basement. Kait Van Zandt, a recent James Madison University graduate and fanatical caver (“spelunker,” it turns out, is an amateur word), leads us through an iron door into a dimly lit vault of hand-dressed limestone blocks that could have been conjured by Edgar Allan Poe himself. This was originally the cavern exit, where those 3,000 visitors in 1924 ended their underground tour. We descend stone steps, reaching a point where the manmade tunnel ends and a corridor of natural limestone dives deep into the mountain—the threshold between the blip of human history and the oblivion of geology. Van Zandt flips an electric switch. Bulbs tucked behind stalagmites flicker on, throwing shadows across a jagged ceiling. We press on, our voices pinging off cave walls, cool, earthy-smelling air filling my nose. Entering this strange realm is exhilarating enough to penetrate the shell of my moody teenager, who peppers our tour guide with question after question. Eliot, who has been looking forward to this family field trip ever since studying Valley and Ridge topography in her Virginia history class, can hardly get a word in edgewise. Aboveground, the Shenandoah Valley offers mountain vistas. Endless Caverns is the first stop on our three-day tour of the Shenandoah Valley’s historic limestone attractions. I’m here because geology fascinates me and because show caves—some of America’s earliest tourist destinations—are struggling to find their place in the modern world. A show cave, unlike a wild cave, lets people with no technical skills or specialized equipment experience the world beneath our world, a frontier comparable to oceans or outer space. Forget “Second Life,” “Minecraft,” and other virtual destinations. Virginia’s limestone caves are strange, fragile places shaped by violent cataclysms and the drip and flow of water over millions of years. Eerily peaceful, immune from daily weather fluctuations, and mostly bereft of life, they are otherworldly in every sense of the word. Today, we associate the American West with canyons and rocky spires, but during the new republic’s first century, the Great Valley of Virginia—the West of its day—awed commonfolk and Founding Fathers alike. Before the Grand Canyon, visitors flocked to Grand Caverns, which opened in 1806. Before Arches National Park, there was Natural Bridge, a solid, 215-foot-high limestone arch that Thomas Jefferson called “the most sublime of nature’s works.” Resorts and stagecoach spurs sprang up to service these and other sites. Later, rail lines and then automobiles brought out-of-staters and foreigners, exponentially increasing visitation numbers. To tour the Valley’s show caves is to trace the evolution of early American tourism. Six major show caves plus Natural Bridge (the remnant of a collapsed cave) dot a 130-mile stretch of western Virginia’s porous limestone spine, from Front Royal south to Natural Bridge. These attractions all predate World War II, with the majority originating during the time of tallow candles. All are a bit worse for the wear, but that only makes them more interesting and authentic. Some receive busloads of tourists, while others struggle to keep their doors open. 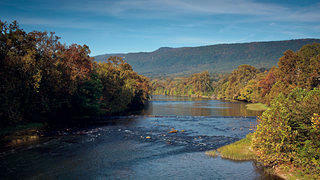 The idyllic South Fork of the Shenandoah River attracts water sports enthusiasts. Endless Caverns falls into the latter camp. Yet as we wander deeper underground along the ¾-mile trail, the caverns themselves, like the stone buildings above ground, appear intact and well-maintained. Van Zandt explains the science behind what look like giant mounds of crystallized soft-serve ice cream. This is calcite—the main component of seashells and pearls—leached from limestone walls by acidic groundwater and deposited drip by slow drip. Formations like stalactites (“t” for top) and stalagmites (“g” for ground) grow at a sub-glacial pace, roughly one cubic inch per century. Even without understanding the science, Valley farmer Reuben Zirkle knew he was sitting on a figurative goldmine when he and his sons discovered the cave in 1879. A month later, they began charging people 50 cents to attend regular “illuminations,” reportedly paying local boys a nickel to scamper in beforehand and light candles. (Today, a 90-minute guided tour costs $18 for adults, $8 for children 4 to 11.) In 1919, Colonel Edward T. Brown of Atlanta bought the property with bigger plans in mind. He added the entrance house and lodge, blasted open passageways, laid a gravel path, and hired a well-known lighting engineer named Phineas Stevens to conceal seven miles of electrical cable and light fixtures, powered with a three-kilowatt Delco generating unit. As we wander, Van Zandt points out remnants from the past: an old iron candelabra, a calcite-encrusted ceramic crock beneath a dripping stalactite that once quenched visitors’ thirsts, and a flat chamber where bootleggers served whiskey during Prohibition to quench another kind of thirst. Locals and visitors alike line up for Pack's Frozen Custard in Luray. By the time Col. Brown’s Endless Caverns opened in 1920, nearby Luray Caverns—the next stop on our underground tour—was drawing close to 100,000 visitors per year. The Norfolk and Western railroad came to Luray in 1881 and soon offered cavern excursion packages to visitors from as far away as New York. “The fame of [Luray] caverns has penetrated the uttermost parts of the earth,” proclaimed an 1896 Railroad Trainmen’s Journal article. On a single day in October 1921, 13 trains offloaded passengers, and 9,470 people bought cavern admission tickets. 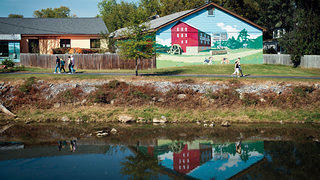 Family-owned Luray still packs them in, with half a million visitors per year. We check in to the nearby Mimslyn Inn, a grand Georgian Revival hotel with a circular driveway, towering Corinthian columns, and a commanding view of the town of Luray. Opened in 1931, the 45-room inn underwent an $8.5 million historic rehabilitation during the mid-2000s. Part of the Historic Hotels of America (HHA) program, it’s a favorite among Washington, D.C., weekenders, as well as the cave curious from all over. The next morning—a cold November Monday—I’m surprised to see Luray Caverns’ Walmart-sized parking lot filling with cars and buses. 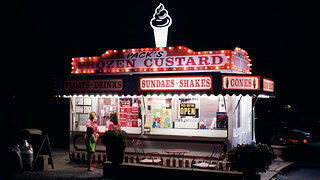 One way the business has remained popular is by adding attractions. The $24 adult ticket ($12 for children 6 to 12) includes an hour-long caverns tour, plus admission to the Car and Carriage Caravan Museum (opened in 1957) and the Luray Valley Museum (2010), where the focus is on the history of local domestic life. Of course, there are also gift shops and a fudge factory. Before I can get too high-and-mighty about preserving cavern purity, my kids, eager to burn off steam, perk up at the sight of a newly added ropes course and garden maze. Why not? First, though, we shuffle into the caverns alongside two dozen other ticket holders. The ceiling in Giant’s Hall soars 60 feet overhead. Dream Lake’s still waters so perfectly mirror the spiky ceiling that the 18-inch-deep lake appears bottomless. We gaze up at the evocatively named Pluto’s Chasm and Titania’s Veil. In another chamber, we hear the 37 rubber-tipped trip hammers of Luray’s famous Stalacpipe Organ, opened to the public in 1957, play “A Mighty Fortress Is Our God” by striking stalactites of different sizes. “Wasn’t that some of the most amazing rock music you’ve ever heard?” the attendant says. A jogging trail in downtown Luray. Back on the road, we see billboards touting underground thrills and a giant hillside sign that reads “Endless Caverns.” At Southern Kitchen, a 1950s roadside lunch counter in New Market, an old oil painting of Endless Caverns hangs above a booth. We pass the towns of Weyers Cave and Grottoes on our way to Cave Hill, the site of Grand Caverns. In 1804, a trapper named Bernard Weyer discovered a cave not far from the well-known Madison’s Cave, which was named for James Madison’s uncle. (Sixteen-year-old George Washington had explored Madison’s Cave during the late 1740s—painting his name across the stone wall—and Jefferson mapped it in 1782.) In 1806, Weyers Cave welcomed its first paying visitors. 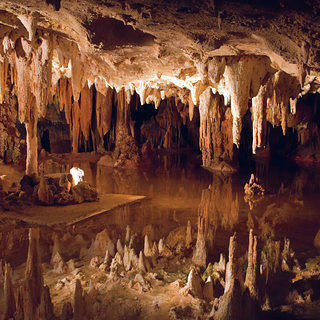 After 208 years of continuous operation, Grand Caverns, as it’s known today, ranks as the country’s oldest show cave. Because we’ve toured Grand Caverns in the past—and because Luther and Eliot need a break from the netherworld—we forgo the guided tour ($18 for adults, $11 for children) and instead poke around the old stone ticket office, inspecting glass cases full of artifacts: a pine-pitch torch, century-old beer bottles, a roll of tickets dated September 8, 1900. In addition to its longevity, Grand Caverns is notable for the hundreds of signatures left on its walls by Union and Confederate soldiers visiting during Civil War battle lulls. During the early 20th century, locals held dances and got married underground. The town of Grottoes, which has owned the cave since 2009, is boosting visitor numbers by making infrastructure improvements, such as replacing incandescent bulbs with cooler, energy-efficient LEDs. It also holds candlelight tours, ballroom dancing, Christmas caroling, and other special events. “Not many small towns have this kind of thing,” says Nathan Garrison, Grottoes’ assistant parks and recreation specialist. 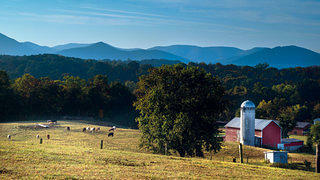 Aboveground, the Shenandoah Valley has plenty to offer travelers as well. Though Virginia wine production was an unfulfilled dream of Thomas Jefferson’s, it’s a growth business today. We stop for a Tuscan-inspired lunch at the lovely CrossKeys Vineyards, one of several local wineries. 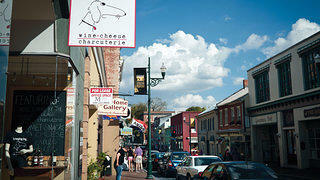 Afterward, we explore Staunton, a charming city of 24,000 studded with historic cut-limestone buildings and walls. Staunton boasts restaurants, music venues, and the refurbished Stonewall Jackson Hotel, circa 1924. Also an HHA member, the Stonewall Jackson features a rooftop sign that washes the night sky in red neon. Beverley Street, in the heart of Staunton's downtown, features antiques stores and restaurants housed in historic buildings. Forty-five minutes further south, Natural Bridge isn’t a show cave (though the adjacent Natural Bridge Caverns opened in 1978), but it’s the perfect bookend for our Valley cave tour. In 1767, a hale and curious 24-year-old Thomas Jefferson set out from Paxson’s Tavern in Glasgow, Va., in search of the legendary stone arch. He was so taken with what he called the “wonder of the New World” that in 1774 he bought it and built a two-story log cabin nearby. The property passed to his heirs, who soon sold it. Beginning in the 1830s, Natural Bridge evolved into a major tourist stop. Adventurous guests, accompanied by a violinist, were lowered from its top in a hexagonal cage. The site will become a state park next year. The paved approach and somber rows of wooden benches beneath the towering arch resemble the understated aesthetic at Grand Caverns. A nearby plaque calls the formation “a miracle in stone...old as the dawn.” I like that. Rather than sit and ponder the imponderable, however, I find myself searching the cold limestone face for the signature of George Washington, who supposedly tagged the bridge not long after he visited Madison’s Cave. I came to the Valley for the geology but am winding up my tour most impressed by the American story written—sometimes literally—on these rock walls. I feel a strange new emotional connection to Jefferson and Washington, who, like me, were humbled and stirred to the core by the Shenandoah Valley’s wonders. How fitting that as the American frontier moved West, these towering figures, who sparked the cataclysm of democracy, were later immortalized in granite atop Mount Rushmore.